A mud-splattered (well, brown paint) edition of our free-wheeling Casket Crusier heads your way later this month! Joshua Herbolsheimer’s Rose Vampire turns the wheel into uncharted territory, kicking up a dirt cloud and generally making a mess. Cast in a neon green vinyl with brown splatters along with blue, yellow, and red spays. Vibrant metallic green leaves and metallic blue cape/bow tie round out the details of the vehicular vampire. 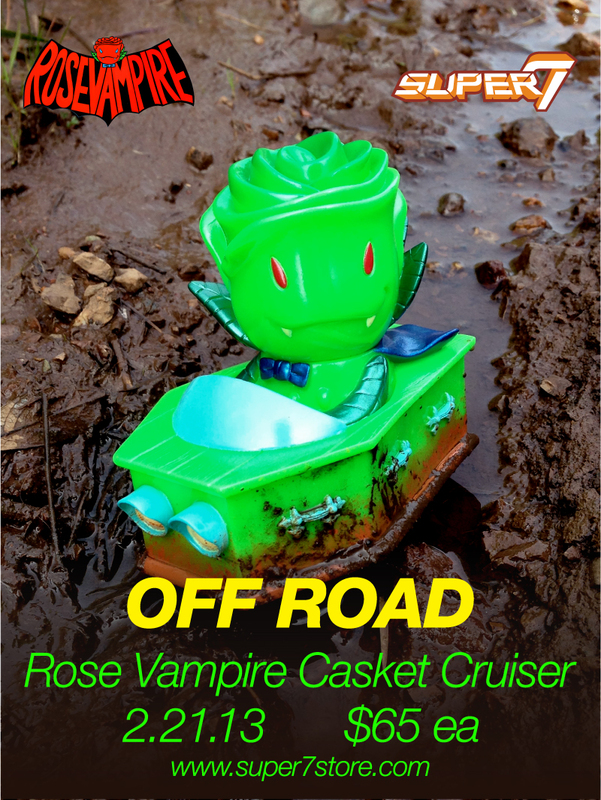 The OFF ROAD CASKET CRUISER measures 4” long and features a poseable head. Metal axles and soft pvc wheels provide the “cruising” part of the title.